© Kuiper et al. ; Licensee Bentham Open. The purpose of this paper is to describe the research surrounding the theories and models the authors united to describe the essential components of clinical reasoning in nursing practice education. The research was conducted with nursing students in health care settings through the application of teaching and learning strategies with the Self-Regulated Learning Model (SRL) and the Outcome-Present-State-Test (OPT) Model of Reflective Clinical Reasoning. Standardized nursing languages provided the content and clinical vocabulary for the clinical reasoning task. This descriptive study described the application of the OPT model of clinical reasoning, use of nursing language content, and reflective journals based on the SRL model with 66 undergraduate nursing students over an 8 month period of time. The study tested the idea that self-regulation of clinical reasoning skills can be developed using self-regulation theory and the OPT model. This research supports a framework for effective teaching and learning methods to promote and document learner progress in mastering clinical reasoning skills. Self-regulated Learning strategies coupled with the OPT model suggest benefits of self-observation and self-monitoring during clinical reasoning activities, and pinpoints where guidance is needed for the development of cognitive and metacognitive awareness. Thinking and reasoning about the complexities of patient care needs requires attention to the content, processes and outcomes that make a nursing care difference. These principles and concepts are valuable to clinical decision making for nurses globally as they deal with local, regional, national and international health care issues. Keywords: Nursing education, clinical reasoning, self-regulated learning, reflective thinking, standardized nursing language, metacognition. The purpose of this paper is to describe the authors’ reflection on research and scholarly activities from the past 5 years surrounding the theories and models which were united to evaluate the essential components of clinical reasoning in nursing education. The research was conducted with nursing students in clinical health care settings through the application of teaching and learning strategies with the Self-Regulated Learning (SRL) Model and the Outcome-Present-State-Test (OPT) Model of Reflective Clinical Reasoning. The development of good thinking habits that support the clinical reasoning seen in expert nurses who acquire these skills through experience are teachable skills nurse educators can promote in nursing students. In addition, students need to master the cognitive and metacognitive thinking skills that support clinical reasoning. Evidence suggests that effective and efficient clinical reasoning is a consequence of intentional reflection supported by self-regulation [1-6]. To function competently in the world of work, student nurses must master the language or clinical vocabulary associated with clinical conditions so that they can prioritize and manage complex patient situations. Thus, a second purpose of this research was to document nursing student use of standardized nursing knowledge terminology in patient care planning activities. To improve student reflection on complex issues in preparation for future practice, educators need to help students “think about thinking” (metacognition) as well as master the language, knowledge, skills, and abilities that support clinical reasoning, clinical decision making and clinical judgment [4, 7]. The development of clinical reasoning skills is positively influenced by the use of pedagogies and strategies that attend to issues of content, structure, process as students learn as depicted in Fig. (1)and defined in Table 1. Content -Structure -Process - Strategies of Clinical Reasoning. Facione and Facione  have defined critical thinking as purposeful self-regulatory judgment that involves a person’s ability to self-monitor, self-evaluate and self-reinforce behavior given a desired goal and context. The development of metacognitive (reflective) strategies and patterns of thinking are difficult for novice nurses to master because their decision making skills are rule dependent, deliberate, and slow, due to a lack of automatic thought and memory encoded experiential patterns [1, 9-12]. The theory underlying metacognitive (reflective) thinking proposes that executive cognitive control strategies are used to monitor and influence cognitive skills and progress [5, 13]. The intentional teaching and learning of such executive cognitive control strategies was the focus of this study. Kuiper [2-3] has developed a model of reflective SRL in nursing shown in Fig. (2). The model describes self-regulation as a dynamic process that includes the observations of behaviors and self regulation of reactions to make self-judgments of competence and areas for improvement for clinical reasoning. The environmental self-regulation of skills, activities, physical context and relationships with preceptors, staff and patients is necessary to determine the context where clinical reasoning takes place. Metacognitive self-regulation includes metacognitive (reflective) self-correction associated with the use of knowledge, and thinking strategies that are used to determine goals. These three types of self-regulation support the development and acquisition of higher order thinking skills such as interpretation, analysis, inference, explanation and evaluation. As individuals move through the states and stages of concrete experience, reflective observation, abstract conceptualization and active experimentation learning occurs . The faculty role is to guide students through the process to correct errors in faulty thinking and encourage deeper levels of reflection. Reflective Self-Regulated Learning in Nursing. Educators can scaffold the process and enhance the acquisition of self-regulation by helping students through the use of journaling with SRL prompts in a given learning episode. Such prompts provide a stimulus to the internal self-talk that supports self-regulation. For example, Table 2 illustrates the SRL prompts that conceptualize the pieces of the model in Fig (2). The environment in which I must perform tests…. Self-regulation training supports the process and development of three important kinds of reflection. Content reflection is thinking about the actual experience. Process reflection is thinking how to handle the experience. Premise reflection involves examining long held, socially constructed assumptions, beliefs, and values about the experience or problem . Higher-order thinking and reflection begins when one determines the complexity and uncertainty about solutions to a particular problem . Uncertain and complex situations, such as those involved in most nursing care scenarios do not depend on simple authoritative answers but require evaluation of beliefs, assumptions and hypotheses of possible interpretations of available data . Table 2 displays the SRL prompts that were used to promote content, process and premise reflection and were designed from the SRL model displayed in Fig. (2). The processes of SRL (Fig. 2 and Table 2) promote the mastery of metacognitive or reflective thinking, which is a key ingredient in the development of clinical reasoning. The self-regulatory strategies are those that students use to monitor, control and regulate cognition or thinking and academic behavior [17, 18]. Helping students develop metacognitive or reflective thinking fosters the self-confidence needed for rapid decision making . Individuals who learn to select, evaluate, revise or abandon cognitive tasks, goals and strategies through internal communication or self-dialogue, that supports self-regulation of learning and problem solving, develop metacognitive awareness . 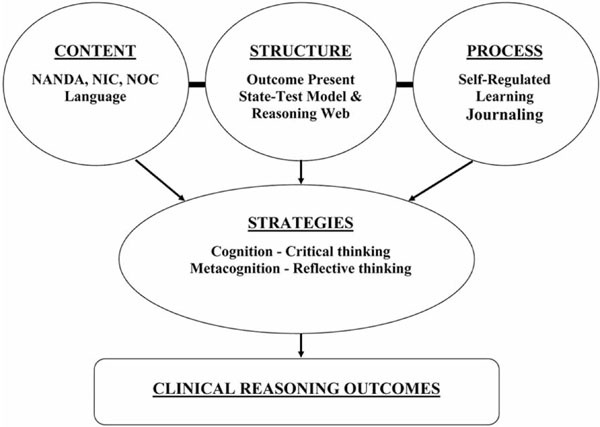 The Outcome Present State Test Model (OPT) of reflective clinical reasoning is a third generation nursing process model that provides a structure for conceptualizing the clinical reasoning process  (Fig. 3, Table1). The OPT Model is a structure or blueprint that helps students organize the thinking involved in clinical reasoning. The model provides a framework for contrasting the relationships between problem and outcome states and provides a guide for problem solving. In using the OPT model, the client story serves as the foundation for a complex uncertain problem and is the stimulus for the clinical reasoning task. A client’s story is influenced by the nurse’s assessment, framing of the situation, and meaning that is given to signs, symptoms, cues and concepts connected with the patient situation. Once the essential elements of the client story are written by the students on the OPT model worksheet, the next step in the reasoning process is to map out and visually represent the relationships among medical and nursing diagnoses using a clinical reasoning web as shown in Fig. (4). A clinical reasoning web is a teaching learning tool similar yet different than a concept map. In this particular study the clinical language or vocabulary that students used to reason about the nursing care needs of patients was operationalized through the use of nursing knowledge classification schemes contained in the North American Nursing Diagnosis Association-International (NANDA)  diagnoses, Nursing Interventions Classification (NIC) , Nursing Outcomes Classification (NOC) , and language taxonomies . These standardized nursing languages provided the content and clinical vocabulary for the clinical reasoning task. As students think, reason, and explain the relationships between nursing problems and nursing care needs, they draw a map by sketching lines of association among nursing diagnoses. As they draw these lines they must give voice to and explain how and why the diagnoses are related or not related to one another. See Fig. (4), Table 1. The reasoning process used to understand the cues from the client story and the relationships that emerge, reveals a focus problem. The nursing diagnosis with the most “connections” emerges as a priority problem. Iterative explanations often link related problems to a specific issue which defines the dynamic relationships between and among other issues. This keystone issue, once identified is the basis for defining the client’s present state, which is contrasted with a desired outcome state. For example if pain is the keystone issue, then comfort or pain control is the desired outcome. The evident gap between pain and pain control serves as a focal point for analysis, implementation and evaluation of nursing interventions. Clinical judgments are conclusions about outcome achievements. A clinical judgment requires four elements: 1) contrast between a present and desired state, 2) criteria associated with a desired outcome, 3) concurrent consideration of the effects and influence of nursing interventions and 4) a conclusion about outcome achievement and intervention effectiveness. The thinking involved in making clinical judgments involves metacognitive awareness, critical, creative, systems and reflective thinking. While working through the OPT model, students are encouraged to use resources and seek out knowledge needed to categorize nursing diagnoses, nursing interventions and outcomes. Many students reason about clinical situations framing patient care needs in terms of medical conditions or pathological aspects of disease. The OPT model guides students to focus attention to primary nursing diagnoses that are the nursing care needs that result as consequence of a medical condition. Students are challenged to explain the relationships between a present and a desired outcome state. They are encouraged to become more conscious of the way they make sense or meaning (frame) of the patient care situation. Framing can be done from a variety of conceptual or disciplinary frameworks. For example, students can view the patients from a medical, nursing or psycho-social lens for the purpose of intervention and outcome determination. To further understand student clinical reasoning, the study also tested the idea that self-regulation of clinical reasoning skills can be developed using self-regulation theory and the OPT model. A purposive sample of baccalaureate nursing students was recruited from a South Eastern American University in a mid-sized city. Clinical experiences occurred in two acute care health care institutions. The characteristics of the 66 students who participated in the study are summarized in Table 3. The variety of students typically admitted to this nursing program reflects a heterogeneous sample and a wide range of individual differences. Some students had no previous years or work hours in healthcare so their results could have altered the depth of metacognitive thinking and reflection. The sample contained older students with families, previous degrees and several years of work experience. Close to 50% were paramedics earning a baccalaureate degree in nursing. All students enrolled in the medical/surgical nursing course had clinical experiences scheduled on telemetry and critical care units. The patient population on the clinical units where the students were assigned consisted of critically ill patients with problems such as multi-system organ failure, burns, multiple trauma, cardio-pulmonary diseases, and post open-heart surgery. This descriptive study used the quantitative methods of Z scores, percentages, Chi-Square and t-tests to evaluate the OPT model of clinical reasoning and the nursing language content over two academic semesters. The qualitative methods of verbal protocol analysis and content analysis was used to evaluate the reflective journals based on the SRL model to expose metacognitive awareness and thinking strategies. Written consent was collected after university ethics approval was obtained. All data collected was kept confidential and the results had no impact on student outcomes in the clinical nursing course in which they were enrolled. All students were required to complete the SRL journals and OPT worksheets as the usual routine course clinical assignments but participation in the study was voluntary, so even if the researcher was the clinical instructor, there was no coercion to participate. Only one student refused to participate in the study and their clinical assignments were not included in the analysis or research findings. The data collection instruments included a work sheet derived from the OPT Model of Clinical Reasoning. An example of an OPT Model worksheet is shown in Fig. (3). The worksheets were used for clinical assignments following clinical experiences and a scoring system was developed with specific OPT model categories to evaluate student works. An example of a Clinical Reasoning Web is shown in Fig. (4). Self-regulation Learning journals consisted of responses to the SRL prompts. Each student completed a weekly journal as an independent activity. Using standardized prompts, students were instructed to think and write about whatever came to mind as they read the prompts and to reflect on clinical experiences. The SRL journal prompts (Table 1) were based on a SRL Model [18, 25] and validated by experts in educational theory. The interrater reliability for the prompts ranged from .70 to .90 . Students completed assignments for 7-10 weeks to support ongoing development of clinical reasoning skills. Finally students completed a Clinical Reasoning Survey tool described in more detail in the next section of the manuscript. Data was collected over an 8 month period in 2003-2004. OPT model of clinical reasoning. Clinical Reasoning A process that enables one to collect data, solve problems and make decisions and judgments to provide quality nursing care in the workplace. Effective and efficient clinical reasoning requires knowledge, skills, and abilities grounded in reflection supported by an individual’s capacity for self-regulation and lead to the development of expertise [1-3, 5]. Clinical Reasoning Web A clinical reasoning web is similar to a concept map of relationships among nursing diagnoses or care needs that result from medical conditions . Determining the interrelationships among nursing diagnoses reveals a priority patient problem that when rectified, would resolve the other patient problems associated with the medical condition. Cognition Critical thinking or the intellectual work that involves reasoning and self-discipline using particular skills such as interpretation, analysis, evaluation, and inference . Metacognition Reflective thinking or a level of consciousness that exists through executive control and self-communication about experiences to monitor and manipulate cognitive processes and progress [5, 15]. OPT Model of Clinical Reasoning The OPT model of clinical reasoning provides structure for clinical reasoning and allows the user to frame and attribute meaning to client stories and evidence while concurrently considering relationships among diagnoses, interventions, and outcomes to make judgments. The user can consider many nursing care problems simultaneously and consider how they interact and influence each other. This systems thinking enables one to discern which priority problem contributes the most influence and which is most important to consider in terms of care planning [5, 31]. Self-Regulated Learning Model A theoretical structure that explains how clinical reasoning skills can be acquired through reflective thinking and critical thinking. Guided reflection using self-regulated learning strategies promotes the development of metacognitive insights to use critical thinking skills for clinical reasoning in particular clinical situations . The self-regulated learning process includes behavioral self-regulation, metacognitive self-monitoring, and environmental structuring to adapt thinking skills to any one particular situation. 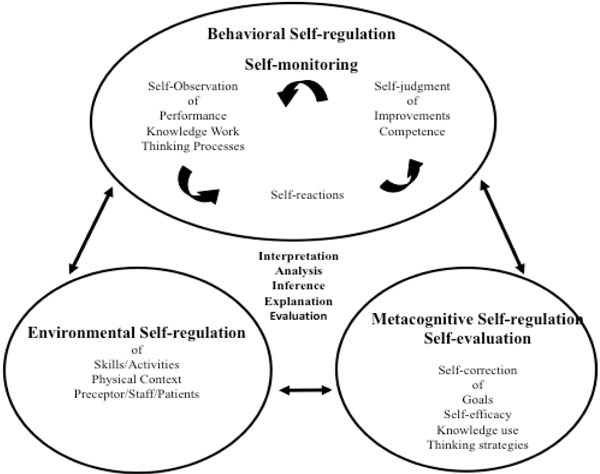 Self-Regulation When cognitive processes are regulated by executive control processes of metacognition and include the skills of self-monitoring, self-evaluation, and self-reinforcement in the pursuit of goals . The aim of evaluating the clinical reasoning progress was accomplished by weekly use of the OPT Model Rating Scale shown in Table 4. The OPT Rating Scale aided the analysis and evaluation of the worksheets to determine clinical reasoning progress . Results showed significant correlations between the sub-groups of students and the ability to frame situations over time (Pearson Chi-Square 6.84, p=0.033) and in the ability to make decisions about appropriate interventions over time (Pearson Chi-Square 9.882, p=0.007). The concept of framing was the most challenging for students to master. Framing may well be a key ability of the expert practitioner and methods to assist novices to identify the larger picture, sort through data, and identify priority interventions, require formal evaluation and attention during the educational process. In this study, increased age was associated with lower ratings on the OPT Model worksheets. “I seek new ways to think about complex patient care situations” (Z -2.30, p=.021). There is an implication that increased self-efficacy with clinical reasoning activities occurred over time with this group of students. An essential component of the clinical reasoning process is the nursing knowledge language the student uses to make choices for a priority nursing diagnosis, nursing outcomes related to the chosen outcomes of the diagnostic problems, and nursing interventions that promote transition from the identified present/problem state to a specified outcome state. 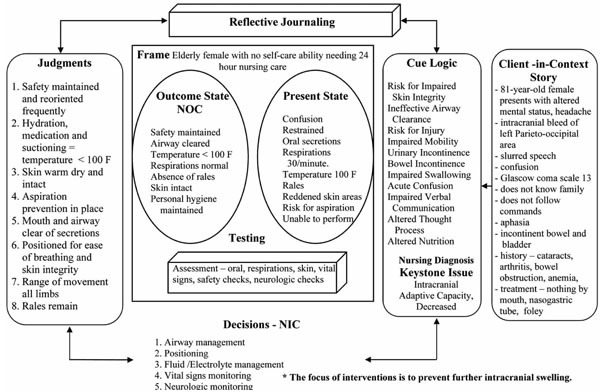 The aim of evaluating nursing knowledge classifications system of NANDA-I, NIC and NOC system (NNN) language  provided the content or clinical vocabulary students used in this study to reason about nursing diagnoses, interventions and outcomes. These nursing knowledge classifications schemes provided the content and clinical vocabulary for clinical reasoning. Use of these nursing knowledge language terms or content for clinical reasoning was evaluated by a retrospective review of the OPT model worksheets in 2005-2006 to determine the degree to which nursing activities, as stated in standardized NNN language, corresponded with clinical reasoning and SRL skill development. Results showed students stated the priority keystone problem in the appropriate NANDA-I format 92% of the time. Nursing outcomes contrasted with NANDA-I diagnoses were in the correct NOC language 22 % of the time and implied in other language 72% of the time. Nursing interventions related to NANDA diagnoses were stated in NIC language 61% of the time and implied in other language 39% of the time. For example, the outcome for a diagnosis of altered tissue perfusion related to renal insufficiency might have a NOC outcome as fluid balance but be stated as no pitting edema. The NIC intervention in this situation could be fluid monitoring or fluid management but be stated as assess IV fluids and IV site. Overall, the clinical reasoning activities with the OPT model worksheets promoted priority nursing diagnoses that were associated with implied outcomes and a list of appropriate interventions . Those students who consistently used NNN language with OPT clinical reasoning worksheets, as measured by the researchers, were also evaluated to be safe practitioners by their clinical instructors. These students had higher ratings on the worksheets. There was no evidence that they in fact had better clinical reasoning skills and this warrants further investigation. The aim of evaluating the process of SRL was important to discover the acquisition of clinical reasoning skills. Retrospective verbal protocol analysis (RVPA) was the method used to examine the nature of students’ reasoning based on the words they used to record reflections. The premise of verbal protocol analysis is that documenting the way subjects search for information, evaluate alternatives and choose the best option is registered through verbalization and analyzed to discover decision making processes and patterns. Information is gathered in VPA about cue stimuli, product associations and terminology used. Verbal protocol technique traces and explains decision making processes and is thus an excellent method for investigating decision making processes. The researchers transcribed student journal responses into word files of sequenced task-relevant statements and content analyzed them with a coding scheme that resulted in descriptive statistics relevant to the concepts of the SRL theory. Word choice enables predictions about problem solving . Verbal protocol analysis (VPA) is a method used to examine the nature of thinking and reasoning based on statements subjects use during decision making processes to enable predictions about problem solving . There are two types of VPA, concurrent and retrospective analysis. Research shows that retrospective analysis gives more statements about the final choice during decision making while concurrent analysis gives one more insight into decision making steps between stimulus introduction and final choice outcome . The goal of VPA is to get accurate reflection of thoughts in short term memory which are then processed and retrieved. Three criteria must be satisfied if the verbal data is to denote underlying cognitive processes; a) relevance – talk about task at hand, b) consistency – logically consistent with verbalizations that just preceded them, and c) memory – information can be remembered . The student journals were analyzed over a 6 month period of time from 2004 to 2005 using retrospective VPA as words and statements were examined and grouped into categories to enable the researcher to pick out the cognitive (thinking) and metacognitive (reflective) thoughts used. The limitations of VPA are that procedural data and decision actions and thoughts may be reported in a socially desirable fashion to impress the researcher. Also, memory failure results in mixed past and present experiences occurring at the same time so choices may be rationalized. Therefore the protocols were broken down into phrases or segments to analyze choice microstructure or words which is more reliable and detailed of the decision making processes taking place [28, 29]. Results showed that most reflections were related to thinking strategies, environmental situations and self-monitoring of performance. When assertional statements were evaluated and compared to a those of a student group who used SRL journaling without the OPT model (t=2.650, df 22, p = .01) , there were more cause and effect relationships in regard to patient care activities in this sample of students than in samples who did not use the OPT model. The changes noted in this analysis display metacognitive awareness and thinking strategies supported by the use of SRL strategies. Self-regulated learning strategies coupled with the OPT model suggest benefits of self-observation and self-monitoring during clinical reasoning activities, and pinpoint areas where guidance is needed for the development of cognitive and metacognitive awareness and clinical reasoning skill acquisition. All students enrolled in the medical/surgical course participated in this descriptive study to adequately describe the clinical reasoning strategies used. The purposive technique of including all enrolled students prohibited the use of a control group. While all but one student agreed to participate, the sample number of 66 precludes a wider generalization beyond the local area due to the lack of power in the sample size. A final limitation was the lack of variability between students on the OPT Model Rating Scale. The authors have subsequently revised this scale to include more evaluation items to determine more specifically where student differences occur . This research supports a framework for effective teaching and learning methods to promote and document learner progress in mastering clinical reasoning skills. Consistent use and attention to SRL strategies and processes is likely to support new graduate nurses as they discriminate between the complexities and uncertainties of patient care situations, and learn to prioritize care, and make effective decisions . The uniqueness of the OPT model of clinical reasoning provides structure is its attention to systems thinking, reflective thinking, the contrast between a present and desired state and the focus on judgment which is often omitted in other decision making models that rely on algorithms, procedures, and protocols . Novices, who transition into the practice role, need mentoring and feedback to sustain the clinical reasoning skills they have learned. The structure, process, and outcomes described through the application and evaluation of this framework which includes standardized nursing language shows that clinical reasoning skills develop over time with practice and feedback. 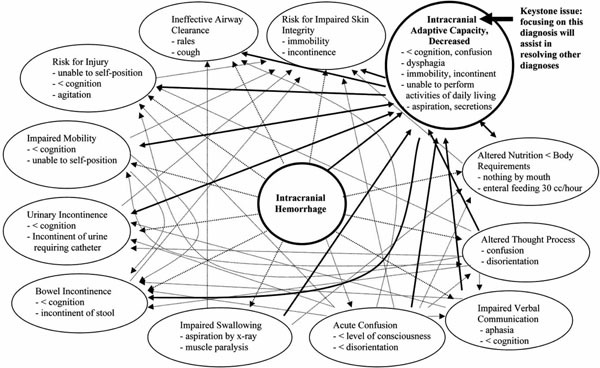 Knowledge needed to inform thinking is not automatic, and reliance on few established patterns in memory limits the ability to identify appropriate nursing interventions . The OPT model and NANDA content may well aid the older non-traditional student who has unique thinking processes related to life experience that impact recall and pattern recognition and thus influencing nursing care planning. The OPT model may also serve to assist the student with previous medical training such as the paramedic to transition into the role of the registered nurse, as these students did not show any unique uses of clinical reasoning skills during the study. Continuous development of clinical reasoning skills is crucial to all areas of nursing to help avoid failure to rescue situations . Capturing changes in clinical reasoning skills’ using these methods reveals a structure for consistent teaching, learning and mentoring of nurses and new graduates as they develop the skills to frame situations and make decisions and clinical judgments with increasingly complex clinical situations. The OPT model has been shown to assist the development of clinical reasoning in students in psychiatric-mental health experiences [33, 34], tested as a debriefing method following with human patient simulation  and as a measure of clinical reasoning as students use personal digital assistants at the point of care . Educators are influential in helping students develop self-regulation and clinical reasoning skills in any and every clinical experience available to them. Educators who promote the combined use of the OPT model and reflective SRL strategies will assist students to use a framework that attends to structure, process, and outcomes for clinical reasoning. This framework supports and reinforces student thinking about patient outcomes, the adequacy of self-judgment and skill competence and the environmental issues that impact performance. Concurrent use of SRL theory and the OPT model teaching and learning strategies enhanced the achievement of clinical reasoning skills in this sample of students. Further research is needed to examine the development of clinical reasoning skills learned over time. Recent research that described experienced nurses who were not yet experts suggests that a conceptual language and clinical reasoning heuristics are needed to speed the clinical reasoning process . The use of the OPT model is a structure that requires attention to a conceptual language and the development of metacognitive awareness that results in a better understanding of practice outcome based activities, improved communication between levels of expertise, and increased self-regulation effectiveness . In addition, the OPT model and SRL prompts need to be used concurrently with other measures to test concurrent validity of clinical reasoning. Reflection on this research from 2004 has resulted in refinement of the OPT rating scale, use of the OPT model with various samples, and in a variety of clinical situations. It is important at some point to synthesize the contributions of the research and the significance of the models to show the connections between the components of metacognitive reflection, standardized nursing language and nursing care planning to give structure to the complex process of clinical reasoning for better understanding of what students are thinking and how educators can support student growth. Thinking and reasoning about the complexities and relationships between and among these needs requires attention to the content, processes and outcomes that make a nursing care difference. Competent clinical reasoning remains a goal of nursing education and a competence desired by employers who hire new graduates. This goal is shared by a global community that has the health care of its citizens as a priority and unites all nursing educators to use the best frameworks when preparing the health care workforce of the future. The authors would like to express appreciation to the American Association of Critical Care Nurses for funding this study as a clinical practice grant, 2002 - 2004. Study design: RAK and DJP. Benner P. Uncovering the wonders of skilled practices by listening to nurses’ stories Crit Care Nurs 1992; 12: 83-9. Kuiper R. Enhancing metacognition through the reflective use of self-regulated learning strategies J Cont Educ Nurs 2002; 33: 78-87. Kuiper R. Nursing students use and experience with the OPT Model of reflective clinical reasoning Unpublished pilot study. Winston-Salem: Winston-Salem State University 2002. Kuiper R, Pesut D. Promoting cognitive and metacognitive reflective clinical reasoning skills in nursing practice: self-regulated learning theory J Adv Nurs 2004; 45: 381-91. Pesut D, Herman J. Clinical reasoning the art and science of critical and creative thinking. Albany: Delmar Publishers 1999. Walker P, Redman R. Theory- guided evidence-based reflective practice Nurs Sci Quart 1999; 12: 298-303. Griffiths M, Tann S. Ripples in the reflection BERA dialogues 1991; 5: 82-101. Facione N, Facione P. Externalizing the critical thinking in knowledge development and clinical judgment Nurs Outlook 1996; 44: 129-36. Corcoran S. Task complexity and nursing expertise as factors in decision making Nurs Res 1986; 35: 107-2. Greenwood J. The apparent desensitization of student nurses during their socialization J Adv Nurs 1993; 18: 1471-9. Lauri S, Salantera S. Decision-making models of Finnish nurses and public health nurses J Adv Nurs 1995; 21: 520-7. O’Neill E. Home health nurses’ use of base rate information in diagnostic reasoning Adv Nurs Sci 1994; 17: 77-85. King P, Kitchener K. Developing reflective judgment. San Francisco: Jossey-Bass Publishers 1994. Kolb D. Experiential learning as the science of learning and development. Englewood Cliffs: Prentice Hall, Englewood Cliffs 1994. Mezirow J. Transformational dimensions of adult learning. San Francisco: Jossey-Bass 1991. Dewey J. How we think: a restatement of the relation of reflective thinking to the educative process Lexington: Heath 1933. Schunk D, Zimmerman B. Regulating motivation and cognition in the classroom: the role of self -schemas and self-regulatory strategies In: Garcia T, Pintrich P, Eds. Self-regulation of learning and performance: Issues and educational applications. Hillsdale: Lawrence Erlbaum Associates 1994; pp. 127-53. Schunk D, Zimmerman B, Eds. Self- regulation of learning and performance: issues and educational applications. Hillsdale: Lawrence Erlbaum Associates 1994. O’Neill E, Dluhy N, Chin E. Modeling novice clinical reasoning for a computerized decision support system J Adv Nurs 2005; 49: 68-77. Flavell J. Metacognition and cognitive monitoring: new area of cognitive developmental inquiry Am Psychol 1979; 3: 906-11. NANDA-International Nursing Diagnoses; Definitions and Classification 2009-2011 Edition. Indianapolis: Wiley-Blackwell 2008. Bulechek G, Butcher H, Dochterman J, Eds. Nursing interventions classification (NIC). St. Louis: Mosby 2008. Moorhead S, Johnson M, Maas M, Swan E. Nursing outcomes classification (NOC). 4th. St. Louis: Mosby 2008. Johnson M, Bulechek G, Butcher H, et al. NANDA, NOC, and NIC linkages: Nursing diagnoses, outcomes, & interventions. 2nd. St. Louis: Mosby 2006. Kuiper R. The effect of prompted self-regulated learning strategies in a clinical nursing preceptorship University of South Carolina Columbia: Dissertation Abstracts International 1999; 9928324. Kautz D, Kuiper R, Pesut D, Williams R. Unveiling the use of NANDA, NIC, and NOC (NNN) language with the outcome-present state test model of clinical reasoning Int J Nurs Termin Class 2006; 17: 129-38. Kuusela H, Paul P. A comparison of concurrent and retrospective verbal protocol analysis Am J Psychiatry 2000; 113: 387-404. Ericsson KA, Simon HA. Protocol analysis. Cambridge: The MIT Press 1993. Haynes L, Butcher H, Boese T, Pesut D. Nursing in contemporary society: Issues, trends and transition to practice. Upper Saddle River: Prentice Hall 2004. Aiken L, Clare S, Sloane D, Sochalski J, Silber J. Hospital staffing and patient mortality, nurse burnout, and job dissatisfaction JAMA 2002; 288: 1987-93. Bland A, Rossen E, Bartlett R, Kautz D, Carnevale T, Benfield S. Implementation and testing of the OPT Model as a teaching strategy in an undergraduate psychiatric nursing course Nurs Educ Perspect 2009; 30: 14-41. Bartlett R, Bland A, Rossen E, Kautz D, Benfield S, Carnevale T. Evaluation of the outcome-present state test model as a way to teach clinical reasoning in undergraduate students in a psychiatric mental health nursing course J Nurs Educ 2008; 47: 337-4. Kuiper R, Heinrich C, Matthias A, Graham M, Bell-Kotwall L. Evaluating situated cognition during simulation: debriefing with the OPT model of clinical reasoning Int J Nurs Educ Scholar 2008; 5: 1-14. Kuiper R. PDA use in clinical practice: a resource to support undergraduate baccalaureate nursing student clinical reasoning Comput Inform Nurs 2008; 26: 90-89. Simmons B, Lanuza D, Fonteyn M, Hicks F, Holm K. Clinical reasoning in experienced nurses West J Nurs Res 2003; 25: 701-19.